Jack Wall's award-winning music from the blockbuster video games Mass Effect, Mass Effect 2, Call of Duty: Black Ops II and Call of Duty: Black Ops III will be performed by the CSUN Media Composition and Studio Ensemble full orchestra at Soraya Great Hall, Valley Performing Arts Center on May 9, 2018. 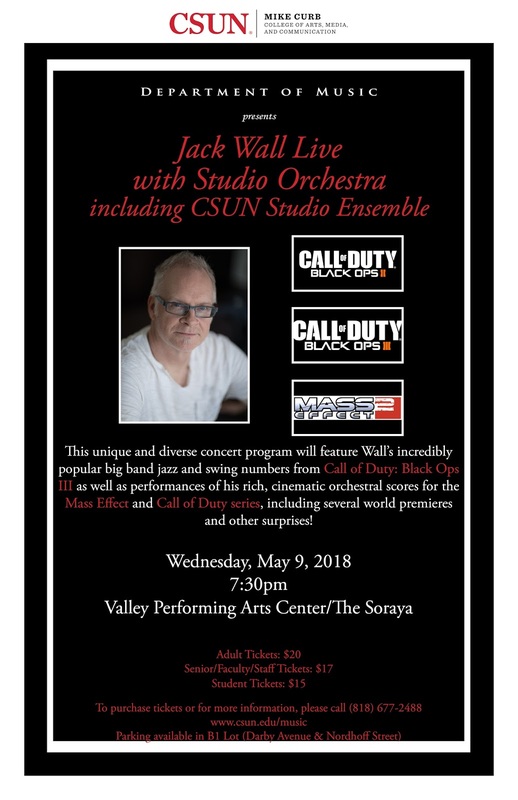 This unique and diverse concert program will feature Wall's incredibly popular big band jazz songs and swing numbers from Black Ops III as well as performances of his rich, cinematic orchestral scores for the Mass Effectand Call of Duty series, including several world premieres and other surprises! Tickets are available for purchase from Ticketmaster and the VPAC Ticket Office: 818-677-3000. The Studio Ensemble is a student band and orchestra for the Media Composition program at CSUN dedicated to the study of popular music styles and playing/recording techniques through the preparation and performance of published works. Their spring concerts feature full orchestra with both professional and student performers. Previous guest artists have included John Debney (The Jungle Book), Mark Isham (Once Upon A Time) and David Newman (Ice Age). Download Jack Wall and Studio Orchestra Live In Concert poster here.